Tonight, via Fitness Food, is this low-fat version of the Greek standard. 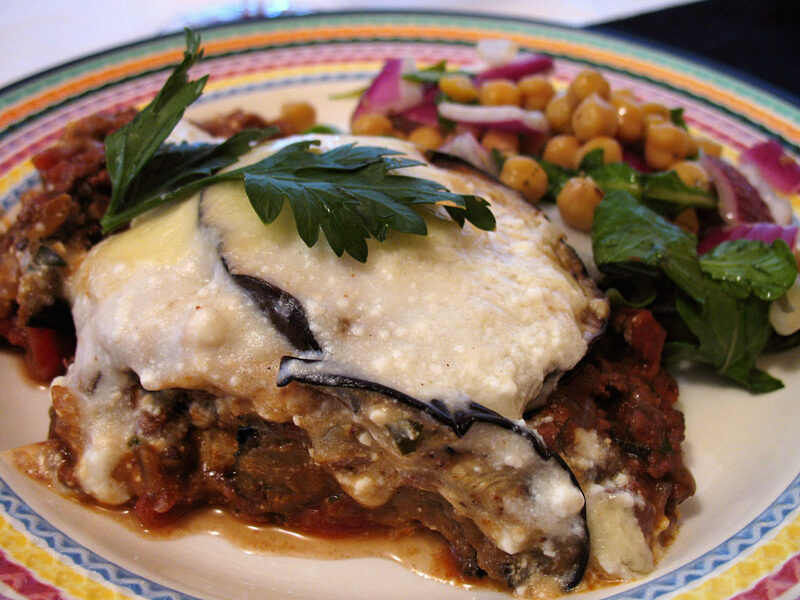 Calories are reduced by grilling the eggplant slices instead of frying them, and when preparing the white sauce eggs are omitted, and lowfat/nonfat milk and cheese are used instead of their full-fat counterparts. The flavors were dead-on, and the portions were generous. We’ll definitely make this one again. Preheat a grill on high heat. Cut the eggplant into 1/4 inch slices. Spray with cooking oil and grill for 4 minutes on each side or until golden. Heat a large non-stick saucepan and spray with the oil. Cook the onions for 3-4 minutes or until softened. Add the garlic, allspice, and cinnamon and cook for 1 minute. Add the lamb and cook 3-4 minutes or until cooked. Add the tomato paste, wine, and tomatoes, and bring to a boil. Reduce the heat and simmer for 35 minutes, stirring occasionally, until most of the liquid has evaporated. Stir in the parsley and season to taste. While the sauce is simmering, preheat the oven to 350F and prepare the white sauce. Melt the butter in a saucepan over medium heat. Stir in the flour and cook for 1 minute. Remove from the heat and gradually stir in the milk. Return to the heat and stir constantly until the sauce boils and thickens. Reduce the heat and simmer for 2 minutes. Stir in the ricotta and nutmeg until smooth and season to taste. Spoon half the meat sauce over the base of a 13″ x 9″ pan. Cover with half of the eggplant. Spoon over the remaining meat sauce and cover with the remaining eggplant. Spread the white sauce over the top layer and top with the shredded cheese. Bake for 30 minutes, or until golden brown. Let stand for 5 minutes before serving. To make the chickpea salad, rinse and drain the chickpeas. Cut the onion into thin wedges. Put the arugula, onion, and chickpeas in a bowl. Add the dressing, season with salt and pepper and toss until well combined. Preheat the oven to 400. Cut the potatoes lengthwise into wedges. Place the wedges on a nonstick baking sheet and spray lightly with cooking spray. Sprinkle with sea salt and bake for 35-45 minutes or until evenly golden and crisp, turning halfway through cooking. Meanwhile, place the egg white and soda water in a shallow dish and whisk until frothy. Put the breadcrumbs in a second shallow dish. Lightly dust the fish with the flour. Dip each fillet into the egg white mixture, then coat in the crumbs, shaking off any excess. Place on a plate and refrigerate for 30 minutes while the potatoes are cooking. To make the tartar sauce, combine all the ingredients, cover, and refrigerate. Ten minutes before the potatoes are cooked, spray a nonstick frying pan with the cooking spray, then heat over medium-high. Cook the fish fillets for 4-5 minutes on each side or until evenly browned and cooked through. 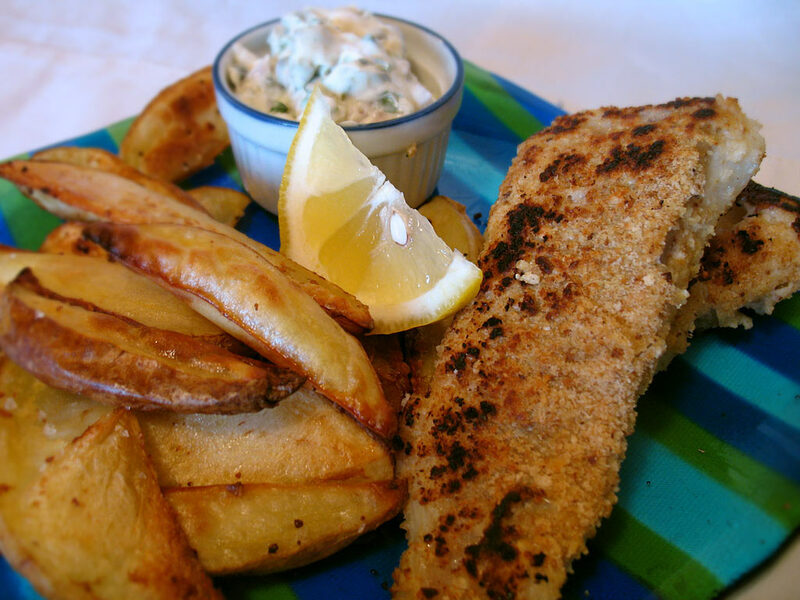 Serve the fish and chips with the tartar sauce and lemon wedges. Lisa was browsing through Fitness Food and found this pretty odd recipe: a baked sweet potato covered with ground beef and salsa. Bizarre? Yep! We liked all the ingredients separately, however, so there was a pretty good chance it’d taste good together… and it did. The sweet of the potatoes was a nice contrast to the spicy salsa, and the corn on the cob we had on the side was well worth the flossing effort later on. Preheat the oven to 400. Prick the sweet potatoes a few times with a skewer. Bake on the oven rack for 40 minutes or until cooked through. Meanwhile, heat a nonstick pan to medium. Lightly spray with the oil. Add the garlic and onion and cook for 2-3 minutes, or until softened. Add the beef and cook, breaking up any lumps with a wooden spoon, for 5 minutes or until browned. Drain off any excess fat. Stir in the kidney beans, tomato paste, and salsa. Bring to a boil, then reduce the heat and simmer for 10 minutes or until slightly thickened. 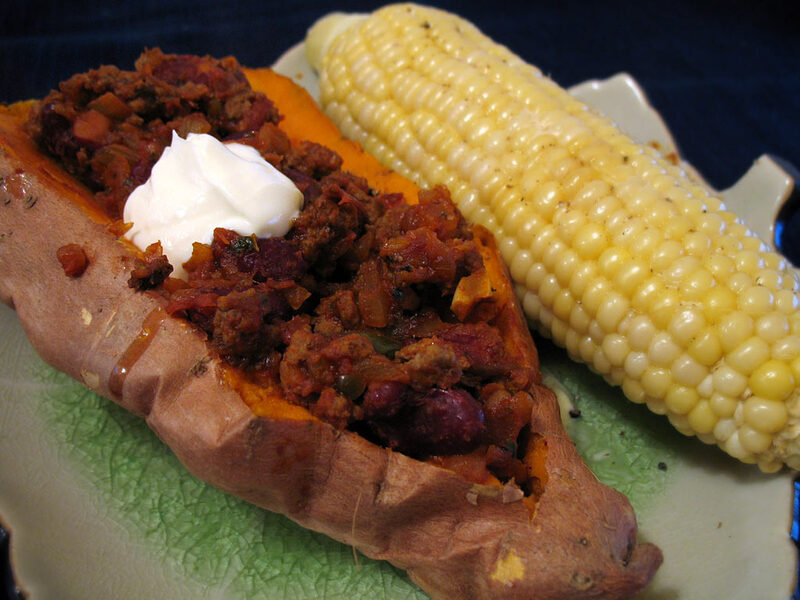 Make a deep cut along the top of each cooked sweet potato. Divide the mixture among them and top with a dollop of sour cream. We had a grilled chicken breast left over from last night’s pasta, and I’m a huge fan of chicken salad [shredded chicken, not cubed, please! ], so I looked up recipes for a version that sounded a little different than the norm. I found this one on RecipeZaar; one bonus is that we had all the ingredients on hand from meals we made earlier in the week. It was just a little saltier than I would have liked (Lisa didn’t add a pinch, that should tell you something), but other than that it was a nice way to use up the chicken for a quick lunch. 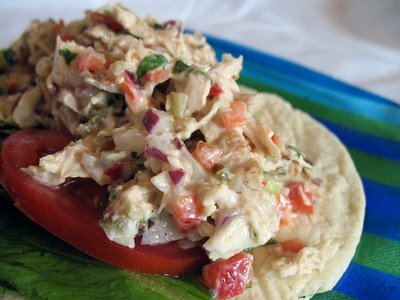 I’m looking for the perfect “classic” chicken salad recipe, so if anyone has any pointers, please leave them in the comments. We modified the recipe below to accommodate the amount of chicken we had on hand, but otherwise prepared it as written. 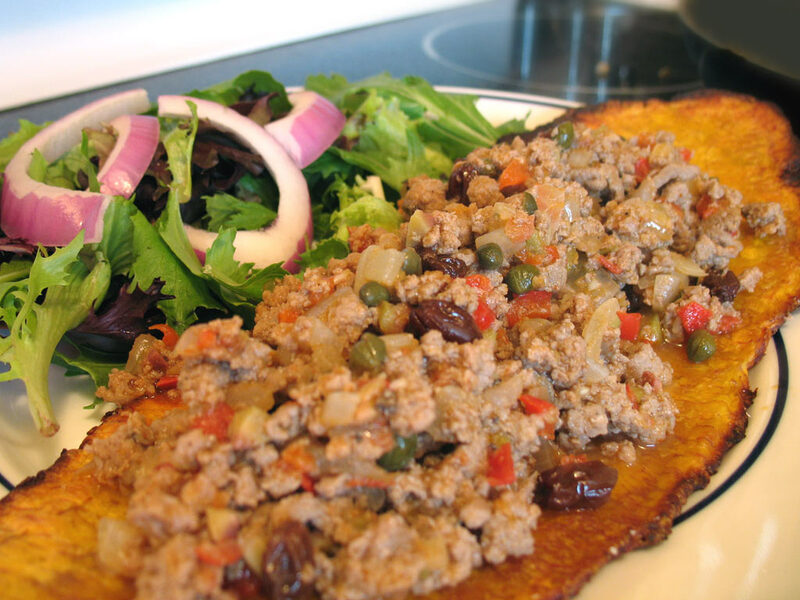 I made mine on middle-eastern flatbread, Lisa used good old toasted whole-wheat bread. Mix mayonnaise and lime juice in a small bowl until combined. Toss chicken, celery, onion, bell pepper, cilantro, and jalapeños in a large bowl. Add the mayonnaise mixture and toss until evenly coated. Serve or cover and refrigerate for up to 2 days.